Vivid Jewellery has put down recent sparkling sales figures to a new online marketing strategy, developed with support from experts at The Source Skills Academy. 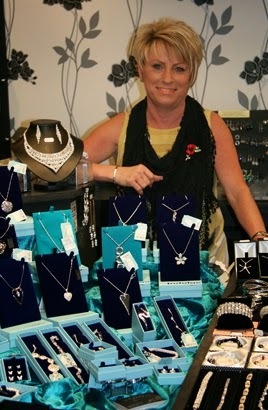 Owner Deborah Pearson started the jewellery business on an outdoor market stall with husband Richard in 2009 with £250 in her pocket. Now she has two indoor stores at Rotherham and Barnsley markets selling fashion jewellery and accessories with prices ranging from £1 to £65 to suit a range of customers. Based at Meadowhall, The Source Skills Academy is a flagship centre providing state of the art training and development facilities with a focus on the retail and service sector. A Rotherham base opened on the High Street in 2011 with support from Rotherham Council and the Skills Funding Agency. In August, Deborah was approached by account manager at The Source, George Fullerton, who told her about a course that The Source offer which is fully funded to businesses who meet certain criteria. After attending the first of three sessions, Deborah started making changes to their online strategy straight away. Whilst they were already using some social media platforms, Deborah was inspired to start using twitter and the business soon had over 600 followers. She also set up a Google plus page which was seen by 7,500 people in the first week. Deborah Pearson, owner of Vivid Jewellery, said: "We knew the course was worth going on as soon as we looked at our October sales. Our October 2014 sales were up 40% compared to October 2013 and we know that isn't a coincidence." The new tools helped Vivid Jewellery sell over 2,000 rhinestone encrusted poppies in the run up to Remembrance Sunday. Deborah added: "I wasn't sure how many we would sell so only ordered 500 limited edition ones with the wording 1914-2014, but they sold out within days with people travelling from across the region just to see them. 10% of the proceeds went to The Royal British Legion which amounted to £2300. This donation will go to the local serving and ex-Service community and their families. "We took so much away from the course that has helped us build the business, not only from the fantastic trainer Dina Holland but also from being around other small businesses; learning what they do differently and sharing best practice." The Digital High Street Skills programme is split into three modules which look at different aspects of digital communications; from websites to Social Media and from e-commerce to eBay, these modules will help businesses strategise their way to new customers. The programme has been developed with the help of the Employer Ownership Fund and with co-financing from the European Social Fund, the National Skills Academy for Retail can offer training and mentoring for small retail businesses at substantially reduced rates. The fund is accessible to all businesses in the Retail, Hospitality, Leisure & Tourism sectors with fewer than 250 employees and in the Sheffield city region.